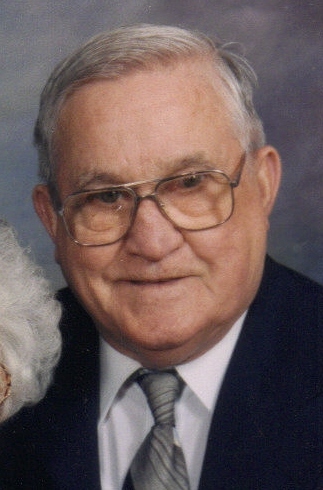 Donald Eugene Parker, 88, passed away Wednesday, February 27, 2008 at the Avera Dougherty Hospice House in Sioux Falls. The son of Elijah and Mary (Halasey), Donald was born on October 23, 1919 in Hazel, South Dakota. He attended and graduated from Hazel High School in 1937. In 1938, he joined C.C.C. at Chamberlain, SD and in 1940 he enrolled again for six months at C.C.C. camps in Roubay, SD. In January of 1941, he went to Santa Monica, California where he worked for Douglas Aircraft until August 1942. At that time, he returned to South Dakota and entered U.S. Navy where he spent three years plus (twenty months in the Pacific Theater) as an Aviation Metal Smith. After discharge in October, 1945, he returned to Bryant, SD and worked as a carpenter. In early 1947, he came to Sioux Falls and worked as a Union Carpenter retiring in 1984. He was united in marriage to Rosella Brown on April 28, 1949 at St. Charles Church in Big Stone City, SD. Throughout his life, Don enjoyed helping family, friends and neighbors with household repairs. He also enjoyed gardening, woodworking and playing cards. Don taught many of his grandchildren to play pinochle and cribbage. He will be held in fond memory by all his friends and family. Don was a member of Christ the King Church, American Legion, Veterans of Foreign Wars, 40 et 8 Club, Knights of Columbus and a lifetime member of the Carpenters Union. Don is survived by his loving wife: Rosella; daughters: Patricia (Harvey) Matthies, Karen Parker, Nancy (Richard) Hall and Linda (Timothy) Whitney; grandchildren: Randy, Greg and Todd Matthies, Nathan (Amanda), Kathleen and David Hall and Mathew and Elijah Whitney; great-grandchildren: Josh, Jake and Brandon Matthies, Kim (Dustin) Comp, Lexy Matthies and Kassidy Whitney; great-great granddaughter: Nevaeh Hagedorn; brothers: Robert (Lorraine) and Jack (Betty); sisters: Betty (Mervin) Lowe, Jean Anne (Richard) Sopkowski and Mary Joan McBride; and brother-in-law: Earl Munkelwitz. Don was preceded in death by a daughter: Kathleen Rose at 16 years of age on February 15, 1966; granddaughter: Jessica Parker Whitney on March 25, 1977 and great-grandsons: Aden and Beau Comp on March 25, 2006; sisters: Alice and Frances; and brother: Gerald. Visitation will begin Friday, 5:00 PM, at Barnett-Lewis Funeral Home with a Scripture Vigil at 7:00 PM. Mass of Christian Burial will be Saturday, 11:00 AM at Christ the King Church with burial to follow at St. Michael Cemetery with full Military Rites by American Legion Post #15.